Performing some of the most loved and revered music created to an impassioned audience of fans can teeter on a fine line of stupidity or bravery, especially when tackling a work as established and celebrated as Pink Floyd's Dark Side of the Moon, writes Servants of Science founder, Stuart Avis. 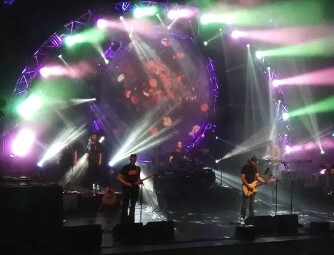 The UK Pink Floyd Experience are a rising force amongst the wealth of tribute bands Brighton-based David Gilmour and co's music has provoked across generations, and have proven themselves more than capable of bravely rising to the task. I was tasked with attending the band's performance at The Capital, in Horsham, last Saturday to preview their forthcoming major event. The band will be bringing their show to Theatre Royal Brighton, on Saturday 9th February 2019, and, alongside a full performance of the seminal Dark Side of the Moon, the show will also feature a complete run through of 1977's Animals album with a healthy dollop of 1975's Wish You Were Here. It doesn't end there though, highlights from other works are cherry picked including a rarely heard and expertly executed Yet Another Movie and live favourite One of These Days. Naturally highlights from The Wall are also included climaxing the show with a rousing Comfortably Numb guitar solo complete with mirror ball showering the audience with a million specks of dancing light. The core five-piece line up of musicians is deftly complemented by a more than impressive light show and use of projections, which features a mix of Floyd's original films and imaginative use of alternatively sourced material. Additional musicians also appear to handle sax and backing vocal duties, Racheal Willment's effortless glide through the lead vocal of Great Gig in the Sky left jaws on the floor. As with the real Pink Floyd the unsung hero of the band is the keyboard player. Rick Benbow takes on the roles of both Richard Wright and touring keyboard player Jon Carin with skill and precision perfectly recreating the sound and textures that helped make the originals so unique. All in all this is not just another Pink Floyd tribute band, the attention to detail is exemplary and the passion of the musicians, who clearly have a love for the music, is palpable. Tickets for The UK Pink Floyd Experience's appearance at Theatre Royal Brighton, on Saturday 9th February 2019, are available by CLICKING HERE.